Back in September, I announced a re-issue of Zeus, Inc. Well, I’m proud to announce that there’s also a new and improved version of The Curse of Hekate now available on Amazon. Of course, that’s been up for about a month now and I totally forgot to blog about it. I promise I’ll try to be better with announcements. There’s also some more changes, in case you missed it: both books are now available in print editions, too. I’ve had so many people asking me about offering the books in print that I finally decided to go old school and have some made. You can buy a print edition from Amazon of both novels, or you can come find me at one of the cons I’ll be attending next year and get one directly from me (I’ll even sign it!). 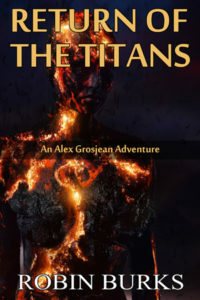 Finally, I’m happy to announce that the third book in The Alex Grosjean adventures, Return of the Titans, has a release date: January 4. Finally, in honor of the holidays, I’m giving away Kindle versions of Zeus, Inc. and The Curse of Hekate for free on Amazon starting Christmas weekend: Zeus, Inc. will be available for a free download that weekend, with The Curse of Hekate up for free on New Year’s weekend.